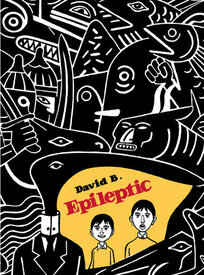 The Copacetic Comics Company | Epileptic by David B.
by David B. This comics tour de force, one of the greatest graphic novels yet produced, is now available in a fine, French-flapped softcover edition that's a true value. How's this for value: the complete 360 page graphic novel in hardcover for the same price as the 160 page Book One in softcover issued by Fantagraphics a couple years back? Not only that, but this edition completes Kim Thompson's excellent translation that he started for Book One. Originally published in six volumes in France between 1996 and 2004, this edition represents the first time the complete story has appeared in English. As readers of David B. 's recently released Babel already know, he is a formidable graphic stylist with a strong and sure line and a great sense of how to use blacks to create a balanced page. Epileptic is the story of an idyllic childhood abruptly and traumatically shattered by the onset of a brother's epilepsy, followed by the ordeal that ensued and the intermittent retreats into fantasy that proved to offer respite. A stunning achievement and clearly one of the most important texts in contemporary comics, Epileptic is, on the one hand, a moving tale of one family's painful experience of raising an epileptic child -- the brother of the author -- and, on the other, is a brilliant parable of the history of Europe, in which the author's family stands as a synecdoche for the continent as a whole, with the brother's travails representing the tribal, ethnic and national obsessions which periodically erupt into the violent seizures of war. In crafting this work, David B. -- who was the winner of the 2005 Ignatz Award for Outstanding Artist -- created a rich and dense visual vocabulary that is truly unique and quite amazing to behold. This attractive hardcover edition is highly recommended for the discerning comics reader, or for an adventurous reader of contemporary literature who'd like to be introduced to the pleasures of comics. It prompted Joe Sacco (Palestine) to state that "David B. is clearly one of the best storytellers in the medium of comics," and inspired Jason Lutes (Berlin) to rave, "David B. works a real kind of deeply human magic on the page – something forged from black ink and a soul's struggle that marks Epileptic as one of the first truly great narrative artworks of the new millennium."